August 2017 Gloria has come a longway. She is now a very healthy and happy young lady! She is enjoying her indoor comfortable life. She has a boy friend, Cullen, who she LOVES to cuddle with. While she is still nervous of strangers she is trusting her foster mom and sitting near her to watch some TV. We are hoping for a lap cat, time will tel!! 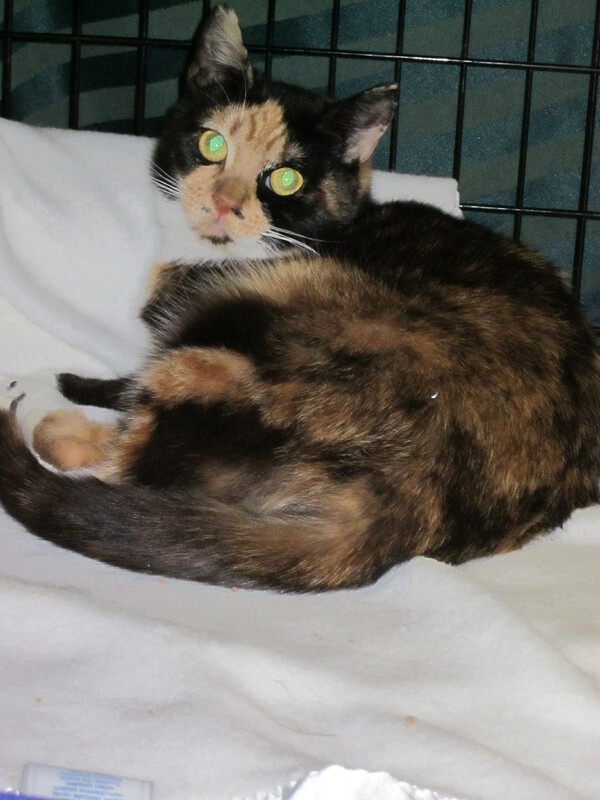 Gloria had a dislocated hip on her right side and a broken hock joint on her left back leg. She is amazing and survived against the odds! Gloria lived in a colony of cats that our volunteer Paula feeds. Every day Paula brings food to about 20 cats that have been abandoned and are trying to survive on their own. Gloria was very fearful of people for good reason, but hunger brought her out of hiding at feeding time. One night she did not show up and although Paula was concerned it would have been impossible to find her. She just had to hope that she was ok and would return. After not seeing Gloria for many days she feared the worst. It was well below freezing every night and she was not coming to eat. Then one night after about a week Gloria appeared but she was dragging her back end across the frozen ground unable to use her back legs at all. She used her front legs to drag herself around. She was so hungry that she braved the obvious excruciating pain to get to food. Paula was heartbroken to see her in such terrible condition. Paula didn't know how to catch her, she did not want to hurt her by trying to pick her up and she didn't want to risk her scrambling away. So Paula tried to use food to lure her into a carrier. Even though Gloria was afraid of people she followed a trail of food into the cat carrier and allowed Paula to bring her to safety. Paula was not sure that Gloria could be saved from her injuries but at least she would not die cold and alone. Once at the vet the xrays showed extensive injuries. Her left hip was dislocated and her right hock joint was obliterated. She had open wounds where the leg was broken. The vet guessed she was hit by a car and the injuries were about a week old. She must have been hit the day she did not show up and suffered somewhere hidden until she was rescued. She was skin and bones and obviously had not eaten for the duration. The vets said she was "tough as nails" and a miracle of survival. Because the injuries were so old and had already began to heal the vets could not do to much but put a cast on her broken leg in hopes that stabilizing it would help it to heal in a way that she could use it without pain. The actual joint may be stiff but other than a limp we are hoping she will walk normally. If the joint causes her problems in the future an operation using pins may need to be done but that will be a last resort. The dislocated hip will also be left as it is. You can't put them back in place, amazingly they heal and create tissue that works just like a joint. The vet expects that in a year you won't know the difference she will walk and use that leg like a normal cat. 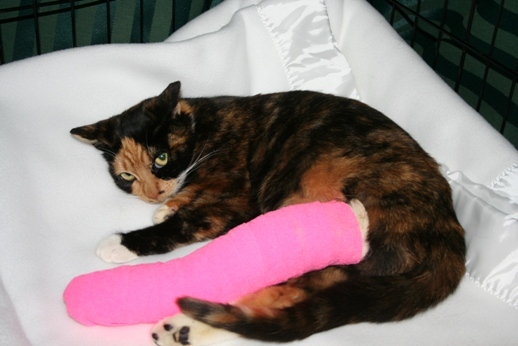 Gloria was on cage rest for several weeks and had her bandage changed from a cast to a splint. A little while ago the splint was removed and she is using both back legs without pain. She is not walking completely normal but she is progressing better than anyone thought she would. Despite her fear of people she allows us to help her.....growling just enough to remind us that she is still "tough as nails" and in charge! Gloria will need a long time to recover and we will need to convince her that not all people are out to harm her. We think she has good prospects of getting a forever home but until then she is loved and safe in her foster home for as long as it takes.